Talbert Manufacturing, a leader in the specialty-built trailer and transport system industry, recently exhibited two newly fine-tuned custom trailer models at the 2011 Mid-America Trucking Show. Attendees viewed the Talbert 55-Ton RA Beam Deck Trailer; and the Talbert 35-Ton HRG Double Drop Trailer. “Each of these trailers is the result of specific customized design features to meet our customers’ exacting specifications; as well as improved engineering initiatives that deliver greater longevity, load capacity, flexibility, and ease of use to our customers. Our sales and engineering staff will be on-hand at the booth to discuss the features, benefits and applications of these units or any others within our complete line of custom-built trailers,” says Greg D. Smith, vice president of sales and marketing for Talbert Manufacturing. The Talbert 55-Ton RA Beam Deck Trailer, purchased by Bill Miller Equipment Sales Inc. of Eckhart, Maryland, features a non-ground bearing gooseneck customized with a 114-inch (versus the standard 108-inch) swing clearance that allows the operator to achieve more weight on the steer axle; a 26-foot beam deck that facilitates a lighter overall weight at a lower ground clearance; a four-axle, heavy-duty suspension offering 30,000-lb. capacity (versus the standard 25,000-lb) and a powerful four-hydraulic cylinder design for greater lifting capacity than many competitive models that only offer two cylinders. The model also delivers an advantage in load capacity over comparable models with a rating of 110,000-lbs. capacity in a 13-foot load base. 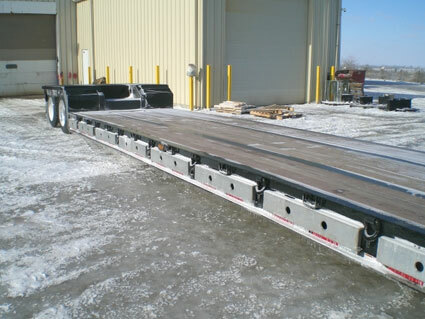 Importantly, the Talbert 55-Ton RA Beam Deck Trailer features a modular design that allows the flexibility of alternating between deck styles to accommodate a wide range of equipment. Also, the customer is taking advantage of an optional four-foot deck insert that can be pinned in front of the first axle or at the rear of the deck to increase deck length to 30 feet when needed.